Vollebak, a sports gear manufacturer with an affinity towards using next-gen materials and technologies, is now selling (for 595 euros!) a graphene-enhanced jacket that according to the company, can perform functions like absorbing heat and then warming you up over time, conducting electricity, repelling bacteria, and dissipating your body’s excess humidity. The process of developing Vollebak’s jacket, according to the company’s cofounders, brothers Steve and Nick Tidball, took years of intensive research. 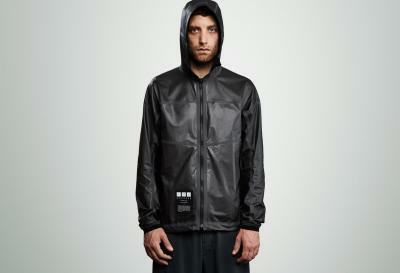 The jacket is reportedly made out of a two-sided material, which the company invented during the extensive R&D process. The graphene side is gray, while the other side appears matte black. To create it, the scientists turned raw graphite into graphene nanoplatelets (GNPs) that were then blended with polyurethane to create a membrane. That, in turn, is bonded to nylon to form the other side of the material, which Vollebak says alters the properties of the nylon itself. “Adding graphene to the nylon fundamentally changes its mechanical and chemical properties–a nylon fabric that couldn’t naturally conduct heat or energy, for instance, now can,” the company claims. The company says that that the jacket is reversible so it is possible to enjoy graphene’s properties in different ways as the material interacts with either your skin or the outside world. “As physicists at the Max Planck Institute revealed, graphene challenges the fundamental laws of heat conduction, which means your jacket will not only conduct the heat from your body around itself to equalize your skin temperature and increase it, but the jacket can also theoretically store an unlimited amount of heat, which means it can work like a radiator,” Tidball explains. Vollebak also says the graphene layer will equalize your natural body temperature by redistributing heat from warm parts of your body to colder areas. The material disperses any extra humidity, too, and the jacket design itself contains no seams. Its pieces–which are laser-cut to avoid waste–are thermally sealed, instead. If moisture does end up inside, the graphene material will halt any buildup of bacteria since it can’t reproduce on its surface. In addition to being bacteriostatic, the company claims, the graphene layer is “hypoallergenic, anti-static, and certified as nontoxic”. The jacket also conducts electricity, although Vollebak had to reduce this property to make it safe. In February 2017, Directa Plus announced that Colmar, the high-end sportswear company, launched a new collection of ski jackets containing the Company’s graphene-based products.